That second shot is just gorgeous. Thank you. I took it from my porch in the midst of a blizzard. Our little town has a population of 524 and only one town truck. In bad storms, there are several individuals with plowing equipment who help out. I would have thought -25 extremely cold for New Hampshire, yet you say it's not as cold as other years. Yes, it is extremely cold. But we normally have many weeks in a row where it doesn't go above zero. That hasn't happened this year so -25 is a bit of a shock. We have lived in NH for 20 years and have often seen temps dip down to the -30s and -40s. It hasn't been that cold for several years though. Global warming? I know you're at the top of New England, but I thought the temperatures in the New England states (and coastal Canada) were buffered by relative proximity to the sea. We are over 200 miles from the ocean and Great Lakes with big mountains in northern NH. We get no benefit at all from water. Where in the East does your mother live? I know belleferret and as I recall, she grew up in northern New York state. She would definitely know about cold. Ohhh, yesss! 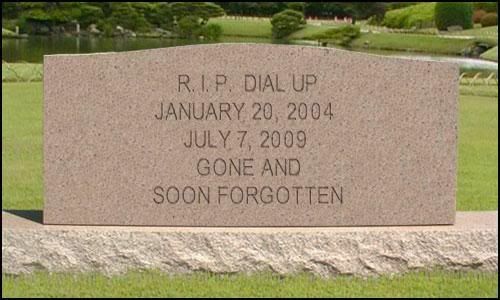 In July, 2009, I threw a sobbing, near hysterical hissy fit and told hubby I simply could not live with dial up any longer. I said I didn't care what it cost, I'd give up anything except my cats and TV, but we had to get Broadband. The only thing we could get was a satellite Broadband system similar to what we have for TV. It's over $100/month, but worth every cent. It's not quite as fast as cable and most DSL, but I can now watch streaming video and it no longer takes 30-45 minutes for a picspam to open. Two of our cats are brother and sister (Spunky and Dancer) whose mother was a stray we took in. She died a few years ago from a pulmonary embolism. Then three years ago, another stray I was feeding disappeared leaving three four-week-old male kittens. We have loads of predators here so one of them must have killed mama cat. She would never willingly have left such young kittens. All five are strictly indoor cats. I don't want to lose any of them. I'm so glad your remaining kitties are safe and sound! And I loved your tomb stone to dial up, ha ha ha! Forgive my lack of knowledge of New England geography. Of course, a pile of mountains would make a huge difference. It makes a difference here and the land is practically flat (compared to real mountains). Here it might be -20, but northwest of the lake it will be far colder, just as in the summer it's cooler here and far warmer away from the lake. And I'm not talking anything like 200 miles! Doh. One thing that's really nice about living in the mountains is while much of the country is sweltering in the summer, we always have a nice breeze and blissfully cool nights for sleeping. In 20 years in NH, I can count the times on one hand that the thermometer hit 90 degrees. We rarely have high humidity because of the wind. But oh my, do we ever have biting insects. It sounds lovely, if intense! Love your icon, too -- looks like it was made right there in your front yard! Glad to hear I'm not the only one. I don't go on line during the day because if I did, I'd never get anything else done. I'm usually on line every evening and into the wee small hours, but there are so many fandoms I follow that there simply isn't enough time to learn something as complicated as Photoshop.